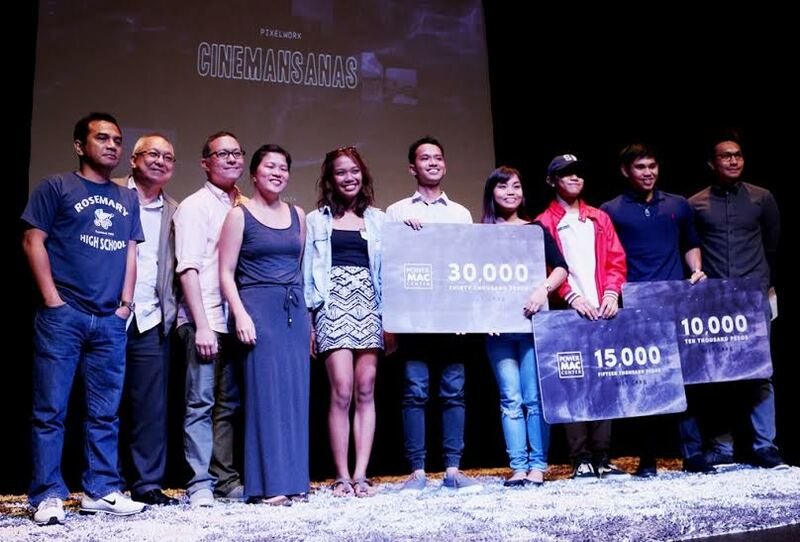 MANILA, Philippines - Premier Apple reseller Power Mac Center has named the winners of the 2016 Pixelworx "Cinemansanas" digital short film challenge in a special screening and awards ceremony held at the Power Mac Center Spotlight in Circuit Makati. (Top row R-L) Power Mac Center Pixelworx Cinemansanas Professional category winners Jessie Villabrille (Gold Award), Edward Golla (Platinum Award), and Dylan Ray Talon (Diamond Award) with Pixelworx ambassadors Monster Jimenez, Mario Cornejo, Ricky Lee, and Yam Laranas. (Bottom row R-L) Power Mac Center Marketing Manager AG Constantino, Pixelworx Cinemansanas Student category winners Jaime Mari Morados (Platinum Award), John Raymond Ilagan and Seliada Asilo (Diamond Award), and Caitlin Casenas and Dion Floreza for Joel Griffiths (Gold Award) with Power Mac Center Marketing Director Joey Alvarez. Diamond Award (1st) - Seliada Asilo & John Raymond Ilagan (FLARED). The short film portrays a story of a blind boy who turned his dark life into a colorful one through his imagination. Gold Award (3rd) - Joel Griffiths (PAGKILALA). Somewhere in the mountains of Tarlac, a longtime hiker unexpectedly crosses paths with another stranger. In coming to know who this young man is, unbeknownst to her, she ends up finding something better. Diamond Award (1st) - Dylan Ray Talon (BIYAHE SA BUHAY NG MGA BATANG BAGOT). The entire conversation presented in the film is an actual footage recorded during the conversation of a group of friends, reminiscing past movies through a guessing game on their way to Manila from an out-of-town team building. Platinum Award (2nd) - James Edward Golla (SEVEN). Carlos is a chief accountant in a trading firm. On his way home from the office, someone has taken a picture of him in a malicious manner without him knowing. It was then posted in a social networking site. Unexpectedly, it went viral. The smart, family-oriented and decent Carlos was bastardized. The film comments on the ability to truly care in an era of misinformation, oversharing and quick assumption. Winners took home up to Php50,000 worth of Power Mac Center Gift Cards each. The Diamond Award winners in both student and professional categories also got the chance to have their films screened during the program. The winners at the 2016 'Cinemansanas' awards. The event brought together premier figures in the film industry and designated Pixelworx brand ambassadors − independent filmmakers Mario Cornejo and Monster Jimenez, seasoned director Yam Laranas, and multi-awarded author and screenwriter Ricky Lee − who served as judges for the competition. In the past months, they also spearheaded a series of workshops in film production, cinematography, direction, editing, and scriptwriting to assist contenders in crafting their masterpieces. This was supported by tutorials for iMovie, GarageBand, and Final Cut Pro X. “The entries to this year’s Pixelworx competition showcase the talent and resourcefulness of Filipino artists. We are honored to introduce the visual storytellers who truly rose up to our challenge of filmmaking using Apple devices only,” said Marketing Director Joey Alvarez. Entries were rated based on creativity of presentation (50 percent) and the quality of technical elements (50 percent). There were three winners in the student category and three winners in the professional category awarded during the ceremony. Power Mac Center has also opened online voting for the Pixelworx People’s Choice Award. All entries that made it to the finals were uploaded in the Power Mac Center YouTube channel. The entry with the most number of likes by May 19, 2016 wins. It will be announced online on May 20. Cinemansanas is the second installment of Pixelworx, Power Mac Center’s advocacy of recognizing artists who break the standards of the art scene. It is celebrated with a series of workshops, live demos, and an ultimate art challenge. More information is available at the Power Mac Center website.